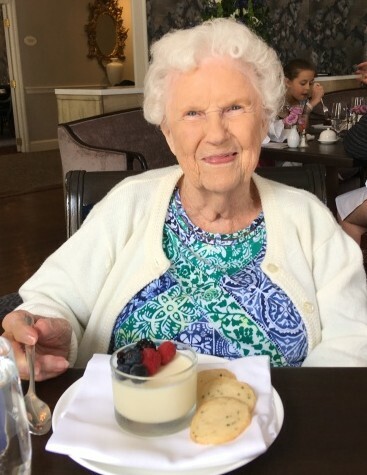 Eleanor White Russell, 91, passed away on Thursday, March 28, 2019 at her home in Williamsburg, Virginia. She was born on June 21, 1927 to the late Dr. Thomas Corwin and Katherine Worthington White. Eleanor graduated from Barnesville High School in 1945. She went on to Denison University and then transferred to The Ohio State University to complete her degree in childhood development. She was also a member of the Alpha Phi sorority. After college, Eleanor worked at John Hopkins in Baltimore and then went back to Ohio State to earn a second degree in dental hygiene. In 1957, Eleanor married Larry Moore Russell and started a family in Miami, Florida. Eleanor and Larry moved the family to Atlanta and then to Philadelphia before retiring in Wilmington, North Carolina. In 2017, Eleanor moved to Williamsburg, Virginia to be closer to family. In addition to her parents, Eleanor was preceded in death by her husband, Larry Russell, brother-in-law, Dr. James McClure, and niece, Susanna McClure Smallcombe. She is survived by her children, Scott and John Russell (their spouses – Susan and Linda Russell, respectively); sister, Martha White McClure; five grandchildren, John-David Russell, Brenton Russell, Melissa Pitzen, Mark Russell and Melinda Russell; two great-grandchildren, Selah and Sage Russell; nieces, Melinda Tetrault, Pamela Armbruster, and Susan Stout; and nephew, Rev. Robert Vance. In honoring Eleanor's wishes, there will be a grave-site service at Crestview Cemetery in Barnesville, Ohio at 11 AM on Saturday, August 17, 2019. Arrangements are entrusted to Campbell-Plumly-Milburn Funeral Home, 319 North Chestnut Street, Barnesville, Ohio. There's still time to send flowers to the Graveside Service at the Crestview Cemetery at 11:00 AM on August 17, 2019.